Google's personal start page now comes with a choice of dynamic themes. Users of the Google Personalized Home page should notice an unusual departure for the traditionally spartan service when they log on this morning to be greeted by colourful graphical themes for the first time. Google has added what it describes as 'dynamic themes' to the customisable Personalized Home service, with six varieties available at first. The dynamic element refers to the themes' ability to change according to the time of day and weather conditions where you are. For example, as the official announcement says, "If you choose the bus stop theme, when it's raining in your neighbourhood, the characters in your bus stop theme will be equipped with umbrellas and rain gear." 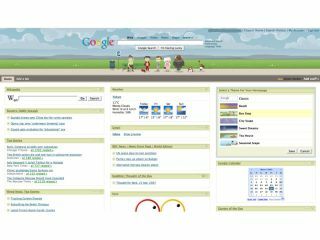 Google's DIY home page offering has been something of a hidden gem since it launched in 2005, with a flexibility and ease-of-use to make most similar start pages green with envy, but an accompanying bland appearance. Now that the internet giant has added a touch of colour to its start page, it surely can't be long before the library of themes mushrooms, possibly even allowing home-made user contributions. Naturally, the whole point of the changes - from Google's point of view - is to have more users faced with their page when they begin the day's internet browsing.